Tired of cold hands? 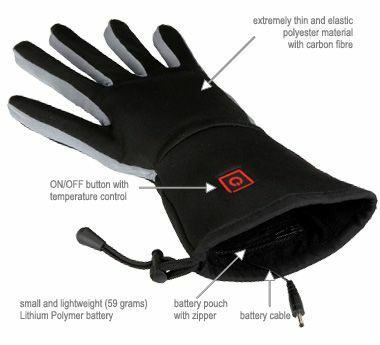 Try Thermo Gloves, the first wireless and rechargeable heated gloves. Made out of a thin material with high-tech carbon fibers throughout that conduct the heat, they can be worn on their own or as a liner under another type of glove (ski, rubber, leather, etc.). There are 3 temperature levels, 93F, 102F and 111F, and the rechargeable battery will last between 2 and 5 hours, depending on which temperature level you select. You can even purchase extra batteries so you have a spare in case the battery runs out. Hurrah, no more cold hands!